The news from Latin America in recent months hasn’t been great. Economic growth this year is expected to be a negative 0.5% , several countries are facing political turmoil, and to top it off, the Zika virus continues to spread across Latin American countries. Yet 2016 could be a turning point for many of the largest economies in the region. Here are five reasons why. 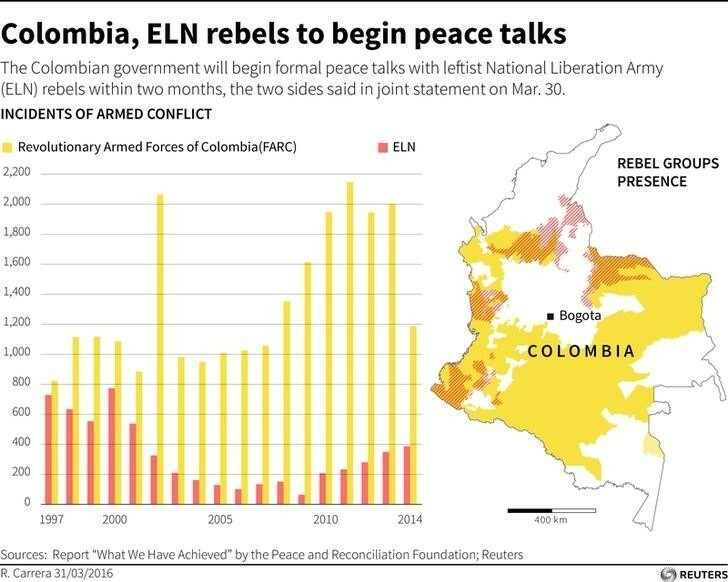 For decades, Colombia has suffered the detrimental consequences of the rebellion by the Revolutionary Armed Forces of Colombia (FARC), and the National Liberation Army (ELN). Over the last 20 years, some 20,000 Colombians are estimated to have died in the conflict. If the peace talks are successful, they are expected to create a windfall for society and the economy. In large parts of the country, people will again be able to live and work without having to worry about the rebellion. For manufacturers, investors and traders, too, an agreement would be positive, as it would create a safer and attractive environment to do business in. It could boost economic growth, which at 2.5% is good, but nowhere near the growth of five years ago, when Colombia enjoyed a commodities-driven economic boom. Anyone who has followed the news from Brazil in recent years knows that the country hasn’t had much to be cheerful about. From a period of fast expansion of up to 6-7%, growth has slowed year after year and is expected to be minus 3.8% this year. On the social front, the growth of the middle class has reversed, and people have taken to the streets to voice their discontent. On the political front, the news has been possibly even worse. After narrowly winning re-election in 2014, President Dilma Rousseff almost immediately faced a political crisis. A corruption scandal involving many Brazilian politicians, including in her own party, eroded the trust of the public and parliament in her leadership. In May, the crisis culminated: the President was suspended and her Vice-President temporarily took over. While the fate of the President remains uncertain, investors seem to believe the worst is over for Brazil. Since Vice President Temer assumed the Presidency temporarily, the stock market has rebounded, and business confidence is on the up. The reason may be that business people and investors alike believe political change will bring about positive change in economic policies. Key financial and economic public functions in the country are now held by former business leaders and economists, including Central Bank governor Ilan Goldfajn , the former chief economist of Itau, and Finance Minister Henrique Meirelles . Another turning point may come from Argentina and Cuba, two countries that are shedding inward looking economic policies in favour of more openness and trade. Cuba has recently restored its diplomatic relations with long-time foe the United States of America. That's the start of a process rather than the end of it. The U.S. will likely lift its strict travel policies, and allow for more tourism and investment in Cuba. That in turn should give a major boost to growth in Cuba, which has long championed health and education for all, while restricting the economic liberties of its population. It would be a welcome boost, but not an easy one to achieve. 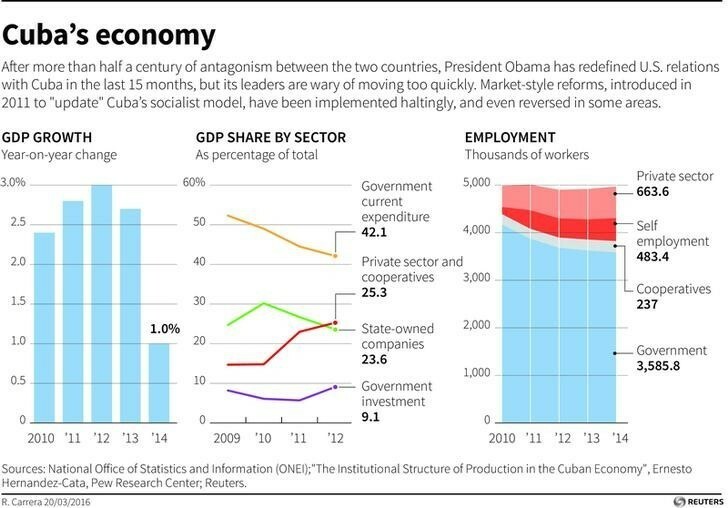 Cuba’s decades-long socialist economic model has generated only modest economic growth in recent years. The private sector and cooperatives account for only a quarter of economic output, and even less in terms of employment. The U.S. is also not the only country with which Cuba is now strengthening its economic relations. At the World Economic Forum on Latin America, Cuba and Colombia will sign a new trade agreement. Argentina, meanwhile, is also continuing its economic reforms, and normalization of its relationship with the U.S. After defaulting on its debt a few years ago and undergoing a long, ongoing legal battle to deal with the consequences, 2016 may be the year Argentina can finally look to the future. While the legal battle on the repayment of its debts is still ongoing, the new Argentinian government of President Mauricio Macri has already ended its country’s political isolation. He won the Presidential election last November, bringing a non-Peronist politician to the highest public office for the first time in 14 years . The country that causes most concern in Latin America nowadays is Venezuela, a nation on the brink of economic collapse. At the heart of that near-collapse is oil, which accounts for the lion’s share of its exports, and a considerable share of its GDP. But low prices mean the dollar income of the black gold is insufficient to cover the country’s basic needs. As a consequence, the government now runs large budget deficits, faces rampant inflation, and has a severe shortage of basic imported goods including food and medicine. In four years, the Bolivar, has lost more than 95% of its purchasing power. The country has some of the highest crime and murder rates in the world, often faces electricity shortages, and is experiencing political turmoil. 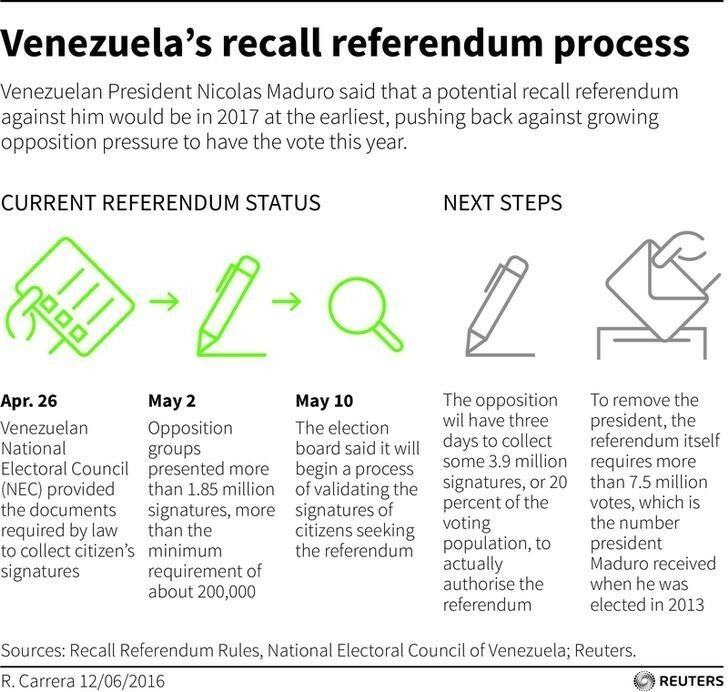 Venezuela’s opposition, who won a landslide victory in last year’s parliamentary elections, is now seeking a recall vote on President Maduro through a referendum. But that vote, if it ever takes place, is not likely until 2017. If there is one thing that keeps Venezuelans’ hopes up it is that things can't get much worse than in 2016. Either the oil price remains low and the government could default or collapse, paving the way for a political transition, or oil prices rebound and the country gets more breathing space to service its debt and import food. If the previous four turning points become reality, Latin America as a whole could rebound from its worst economic performance since the Latin American debt crisis of 1982-1983. The IMF in recent years has constantly revised its growth forecast for the region downwards. But the end of that negative cycle could be in sight. In its latest economic growth forecast, the Fund said it expected the region to experience 1.5% economic growth in 2017, up 2% from this year’s projection of -0.5%.